$15 Course Promo Code: JANUARY1517 Expires Feb 1, 2017 at 9am EST. Apple's iOS 10 is here. We’re guessing you’re not quite ready, but you know you need to be. You have to stay up-to-date on operating systems to keep your best clients and get new ones, but it can be difficult to stay abreast of the changes. 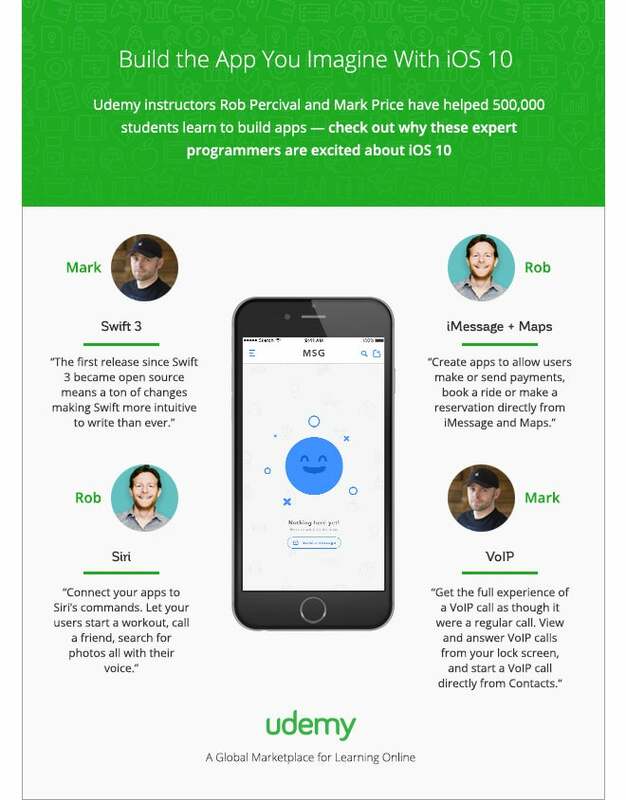 Two of Udemy’s most popular instructors -- Mark Price and Rob Percival -- are back with must-attend courses that cover everything you need to know about iOS 10, how it will affect you, and what awesome new features you can integrate into your apps to really "wow" your clients. From Swift becoming open-source, to connecting with Siri, to integrating with iMessage, they have your back on all the latest changes. Allow us introduce you before you get started. Price is an ex-tech consultant and all-around app development pro. After making a name for himself in the technology consulting world, he dove into developing, and has 57 apps under his belt. With iOS 10 and Swift 3: From Beginner to Paid Professional, he’s sharing everything he knows about the newest changes. Then there's Percival, who runs the well-known web hosting and design service Eco Web Hosting and is the instructor for Udemy’s most popular and highest rated paid course. He’s bringing you The Complete iOS 10 Developer Course - Build 21 Apps. Learn from the best as he uses the most popular apps to teach you development concepts – by making your own clones of current apps such as Instagram and Snapchat, you’ll get a behind-the-scenes view at what makes these apps incredible.